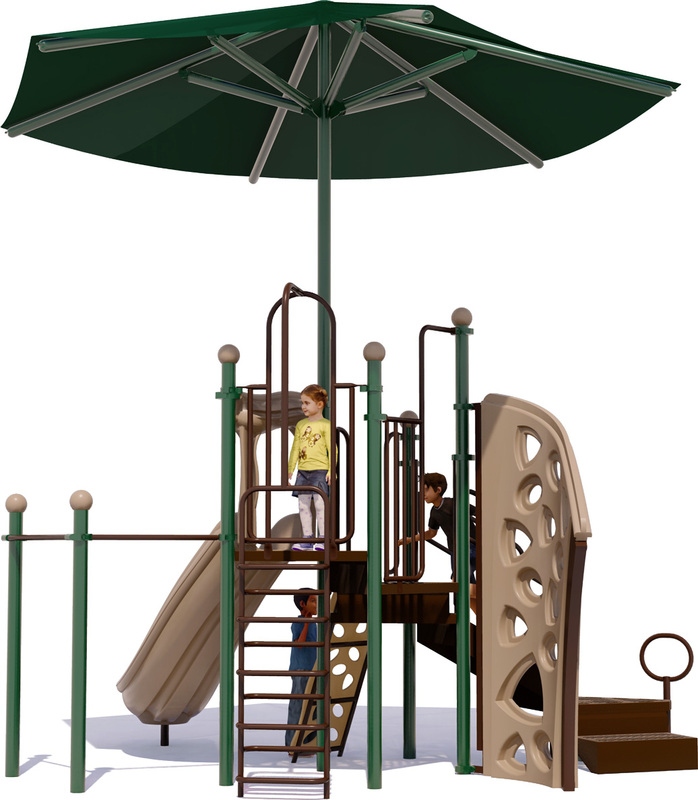 The Kool Kids commercial play structure provides three different climbing options to get to the deck where the slide is accessed, and is covered completely by an over-sized hexagonal fabric shade. 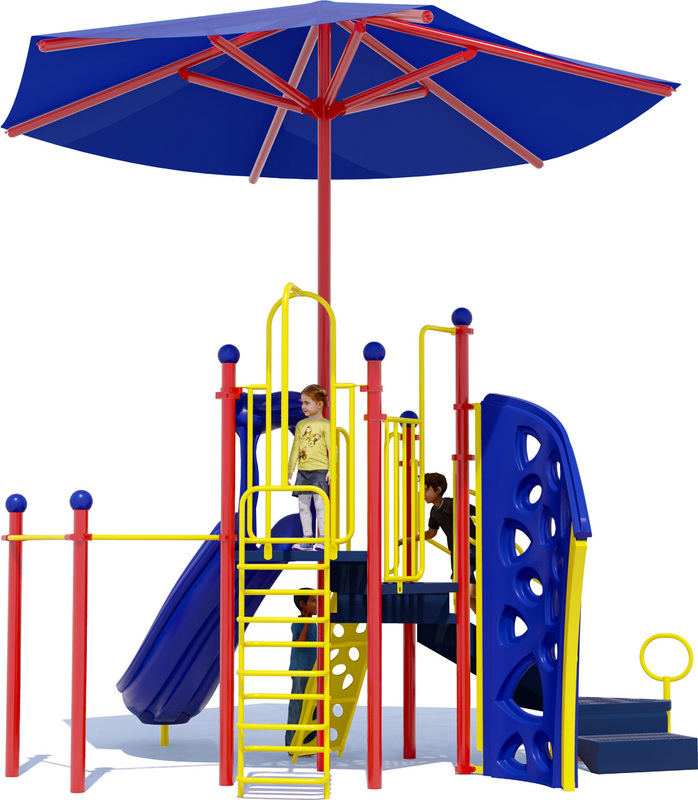 This commercial playground equipment provides six activities for up to 25 children ages 5 to 12 years old all while protecting them from harmful UV rays. 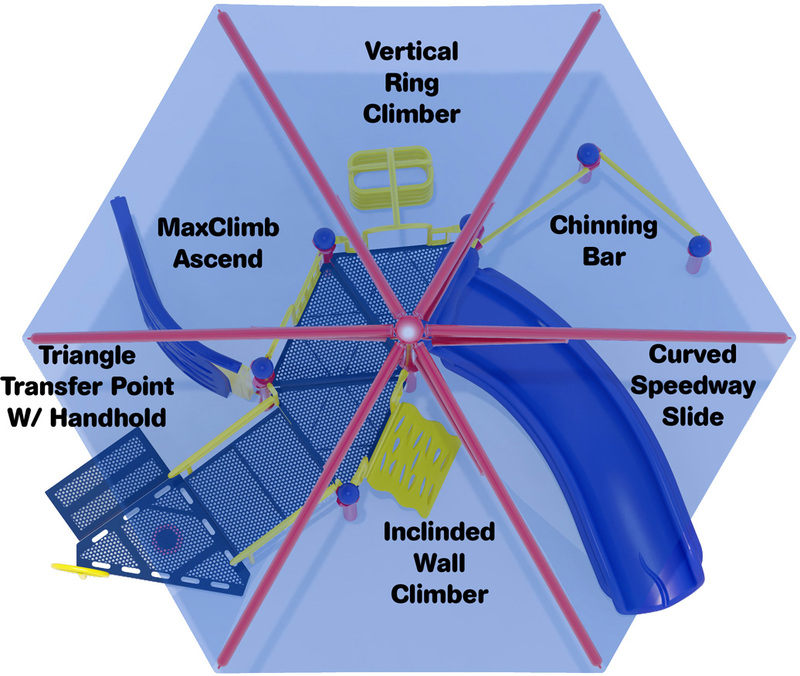 The prominent feature of this commercial playground is the MaxClimb Ascend. It features a unique shape constructed from comfortable and sturdy rotationally-molded plastic with plenty of foot holes and places to grip. It really lets kids gets some physical fitness accomplished all while they play. 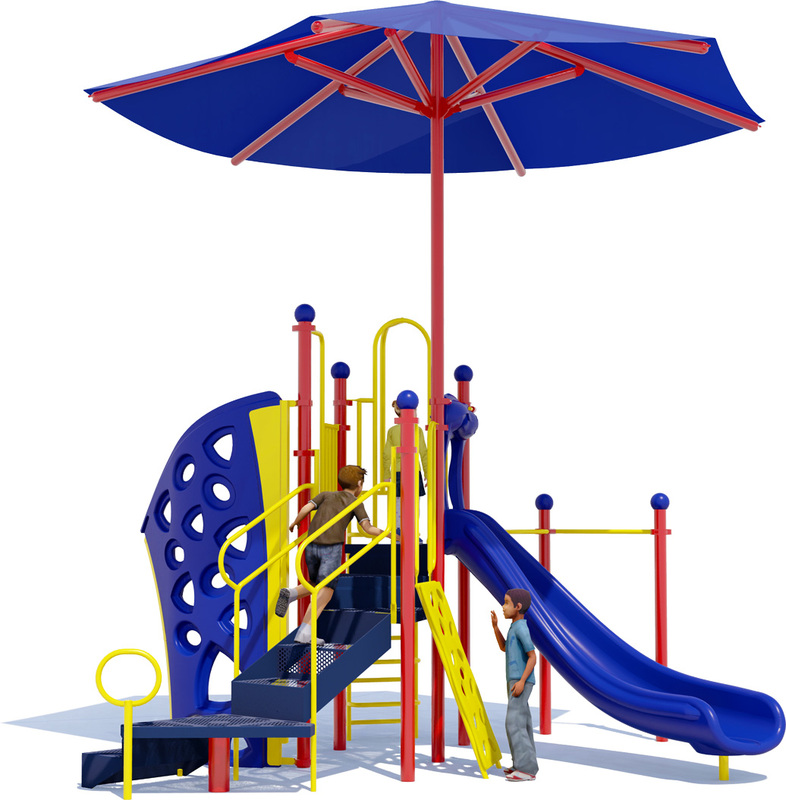 There is also an Inclined Wall Climber and Vertical Loop Climber that provide access to play deck. All three of these play events work out upper and lower body muscles. For upper body muscle development there are two Chinning Bars attached to the heavy duty posts. But kids just want to have fun! And they can enjoy a fast and exciting trip to the bottom on the Curved Speedway Slide. All of this happens under a Single Post Hexagon Fabric Shade. Our fabric shades are designed to withstand wind gusts of up to 90mph, and the fabric is both rot and mildew resistant. An exhilarating Curved Speedway Slide. A Vertical Loop Climber offers alternative access to the play deck. Two Chinning Bars for pull-up style exercises. A Single Post Hexagon Fabric Shade. UV stabilized and rotationally molded plastic parts. High Density Polyethylene (HDPE) plastic activity panels. Lead-free Polyethylene coating on punched steel decks for optimal durability. 3-1/2" O.D. x 12 gauge galvanized aluminum posts are powder coated. Meets ASTM and CPSC standards. ADA Accessible via transfer point for inclusive play. 15 year limited warranty on punched steel decks and roto-molded and HDPE plastic components. Metal pipes, rungs, loops, and rails are backed by a 50-year limited warranty. Choose from two standard color options in bright primary colors or natural, neutral tones or ask about customizing with a color scheme to match your existing building or other park structures. For additional safety we recommend our quality playground surfacing which comes in a variety of options including natural looking engineered wood fiber, or color-customizable recycled rubber. 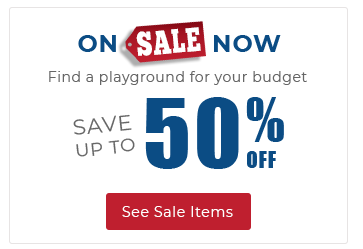 Ask an American Parks Company playground specialist what safety surfacing material works best for you and your budget. If you're ready to order your commercial playground equipment call us at 1-800-381-4491, or fill out our Quote Request form online. 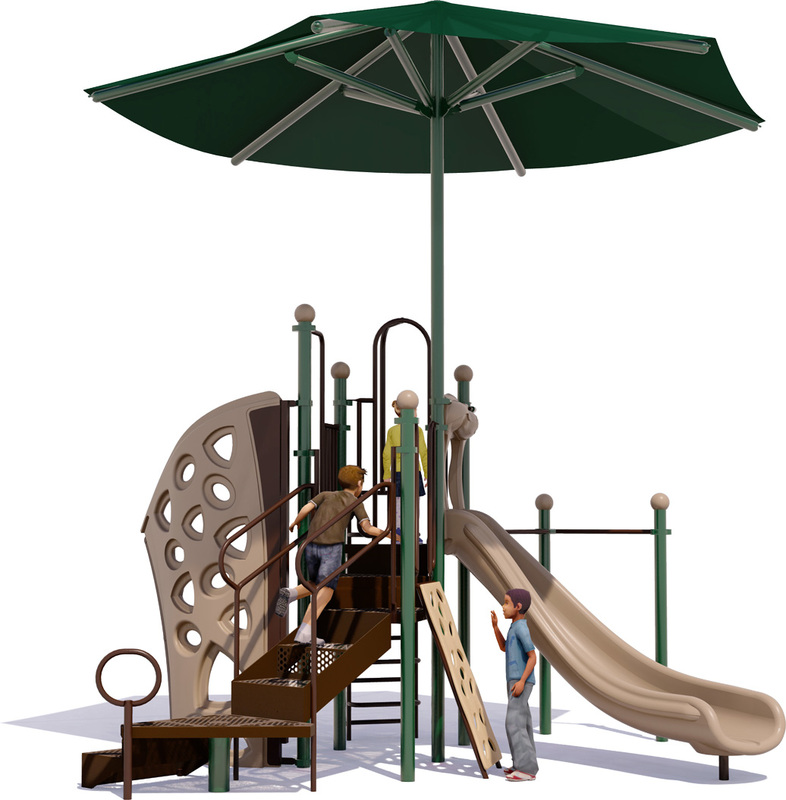 We'll also help you design a total playground package with site furnishings (picnic tables, park benches, waste receptacles, and more), and pricing for shipping and installation should you require it. 1 Slide, 3 Climbers, Chin-up Bars, Fabric Shade, And More!